Don’t Let The Pigeon Run This Party! Pigeon’s Back and he’s madder than ever! I am so excited for next week. 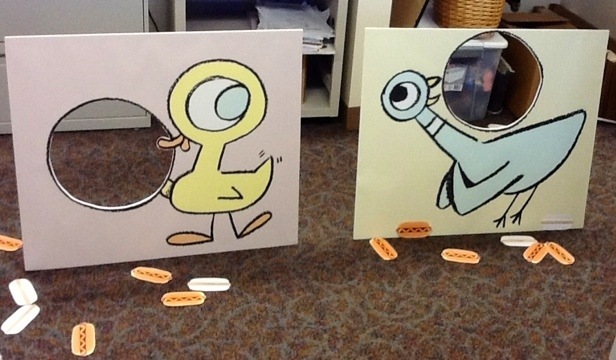 We’re having a party to celebrate the release of The Duckling Gets A Cookie?! I have many fun activities planned. We’ll be doing a “draw the pigeon” workshop. And we’ll be writing our own pigeon stories using Don’t Let the Pigeon Run This App! on my iPad. We’ll also be using several ideas from Mo’s awesome event kit. Finally, I set up this (admittedly odd) idea I’m borrowing fromLate Night With Jimmy Fallon. Audience members are invited to the stage where they go head-to-head tossing uncooked hot dogs into the mouths of celebrities. When I started planning this event, this was the first idea that popped into my head (the connection between pigeons and hotdogs is forever wedded in my mind). Fallon has a decidedly more adult name (“Hotdog in a Hole”), but I’ll just call it “Feed the Pigeon! Feed the Duckling!” I am also using pictures of hotdogs instead of the real thing (eeewww!). I printed up a whole bunch of them and glued them onto popsicle sticks to give them a little weight. As you can see, I tried it out. It’s actually pretty tough, but I think it will be a fun activity. Finally, we’ll eat cookies and share the stories we wrote on the iPad. Thanks Mo! You’re the best! 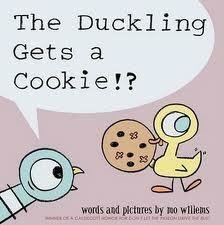 Categories: ALL | Tags: Book Parties, jimmy fallon, Mo Willems, Pigeon, The Duckling Gets A Cookie?! | Permalink. Looking for Pigeon Party ideas and found this. Thanks for all the great ideas—and I must say I envy anyone who can say “sent them to our graphics department”! This is great, Cate! What age group are you opening this up to? Ages 4-8, with a grownup. I love these ideas! Can’t wait to get my hands on the book.